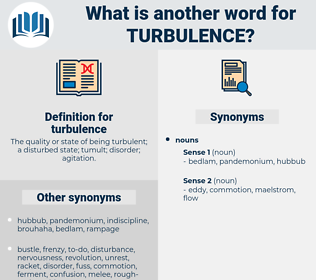 What is another word for turbulence? 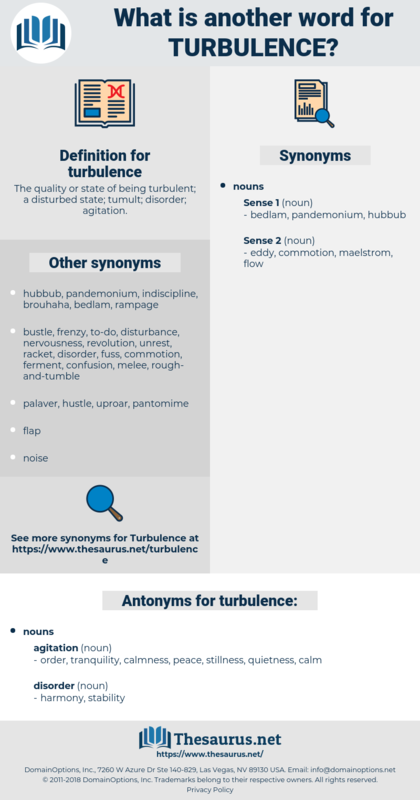 The quality or state of being turbulent; a disturbed state; tumult; disorder; agitation. stamina, destabilization, trouble, churning, stir, anxiety, excitement, downturn, destabilisation, inconvenience. disruption, volatility, restlessness, agitation, tumult, perturbation, commotion, dislocation, turmoil, strife, fluctuation, disquiet, insecurity, uproar, confusion, ferment, storm, unease, uncertainty, rioting, crisis, concern. order, tranquility, calmness, peace, stillness, quietness, calm. One of the sovereign virtues of this famous law is its simplicity, which is such that all hearing must understand; and obedience is so easy that any nation refusing is unfit to exist except in the turbulence and adversity that will surely come to it. It was owing probably to the feebleness of their character or to the turbulence of their barons that we must ascribe the poor part they played in the revolutions of the Eastern world at this time. countercurrent, riptide, tide rip, rip, crosscurrent.